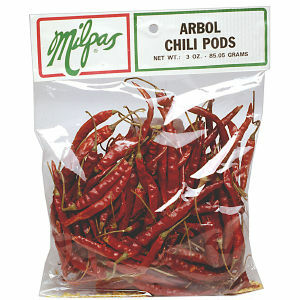 Milpas Arbol Chili pods are used to make salsas. They are full of zest and flavor. They are very hot. They are not as hot as the habaneros but hotter than New Mexico pods. Similar in heat to the japanese peppers. The arbol pepper is larger than the japanese pepper and is packed with the stems on.